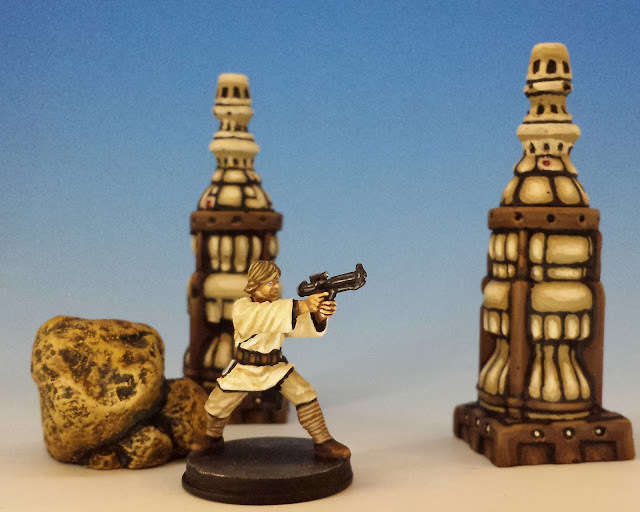 I've just painted over 100 pieces of scenery for Star Wars Imperial Assault. And I'm tired. CombatZone Scenery, a company in the UK, produces a beautiful line of terrain tailored for the game. Rendered in heavy casting plaster, the pieces reproduce the 2-dimensional features printed on the map-tiles, as well as other items like control consoles and supply crates. Terrain is central to achieving an authentic Star Wars feel... what is Tatooine without the lonely moisture vaporators, or a Rebel base without glowing tactical screens? So I'm happy that there's a way of bringing these places to life in 3 dimensions. The only problem is the cost in money and time. Buying and shipping all this terrain cost me almost $250 Canadian -- and then it was about 7 weeks of intense painting. That's a long time to spend painting crates and snowbanks. But, in the end, it's worth it. One of my recurring themes is that Imperial Assault is a game that straddles a borderland between board games and proper war-games. A key difference between these two categories is a board game is ready to play out of the box, but a war-game only becomes playable after a long labour of love: collecting the miniatures, imagining the armies, customizing the models, assembling the terrain, planning, painting and presenting. I've always wanted a proper Star Wars war-game -- one with broad horizons for the hobbyist in me. I suppose Fantasy Flight Games made their game a little bit too structured and a little bit too easy for my tastes. Well, screw them. 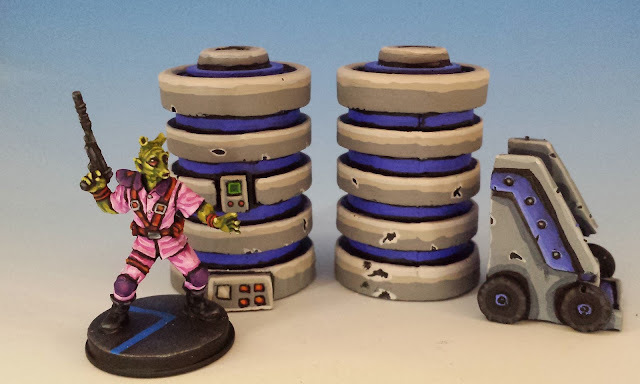 I'll keep on finding new ways to make Imperial Assault costly and time-consuming. Thanks for looking. 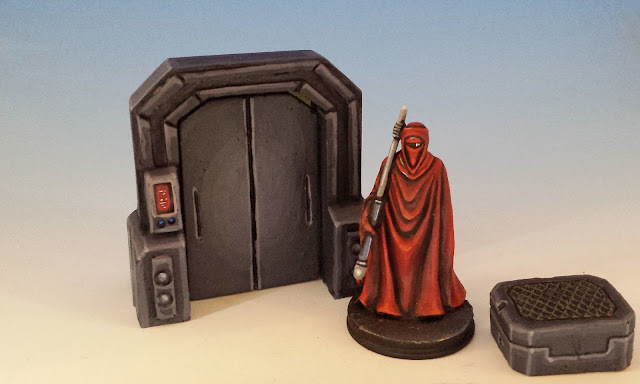 And don't forget: if you like Imperial Assault, I have galleries of the complete painted miniatures for the Rebels, Imperials and Mercenaries. Some fantastic looking terrain there. Nice understated OSL on the displays. I also excel in making my hobby more costly and time-consuming. Where's the fun in frugal efficiency? Gorgeous! The cost and time has put me off, but they look fantastic. Excellent I applaud the cost expense and most of all the final product! Looks like a labour of love. Good work, they should enhance your games plenty. Fantastic! 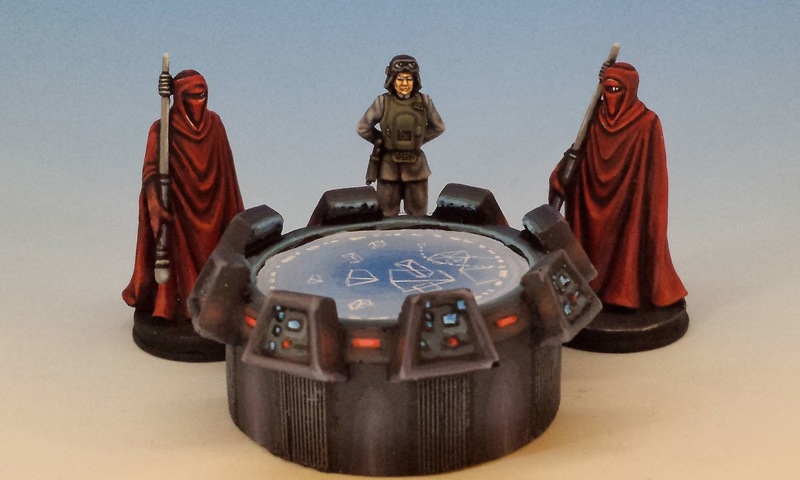 These look great, and I agree wholeheartedly with your sentiment about Imperial Assault. It is a little too card-based boardgamey out of the box for a good wargame. Would love to see an official Frostgrave-like skirmish wargame sourcebook come out for Star Wars. The minis game from Wizards from a few years back wasn't half bad, but the minis weren't as good as the FFG ones you painted above, that's for sure! 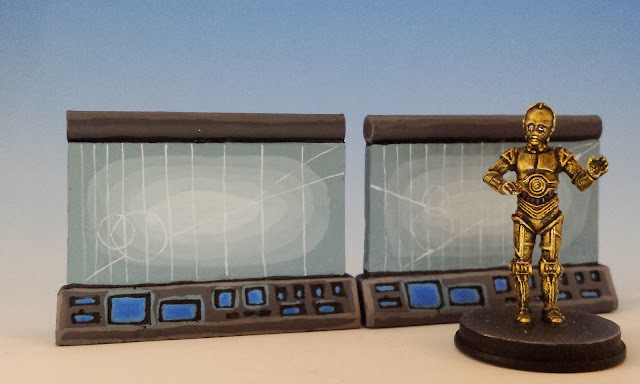 Great work on those scenery pieces. Remember you can use them for other Sci-Fi based games as well, which gives even more value to them. Wooooow! I love what you did here! I totally agree on your boardgame/wargame approach, I love this scenery. Duly noted, I may as well steal your inspir... ehm... pay you a tribute! Beautiful stuff. I think these elements really add to the game. Where did the display screens that C3PO is standing in fromt of come from? 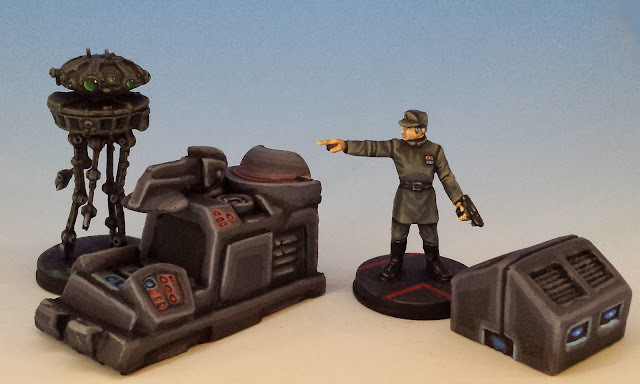 From Combatzone.com's set of Imperial Assault scenery for Return to Hoth. I would love to feature your work on PawnsPerspective.com. How can we get in touch? I just sent an email to pawnsperspective.com. If I didn't get the right address, just let me know.